Albert Einstein (; German: [ˈalbɛɐ̯t ˈaɪnʃtaɪn]; 14 March 1879 – 18 April 1955) was a German-born theoretical physicist. Einstein developed the theory of relativity, one of the two pillars of modern physics (alongside quantum mechanics). Einstein's work is also known for its influence on the philosophy of science. Einstein is best known by the general public for his mass–energy equivalence formula E = mc2 (which has been dubbed "the world's most famous equation"). He received the 1921 Nobel Prize in Physics "for his services to theoretical physics, and especially for his discovery of the law of the photoelectric effect", a pivotal step in the evolution of quantum theory. Near the beginning of his career, Einstein thought that Newtonian mechanics was no longer enough to reconcile the laws of classical mechanics with the laws of the electromagnetic field. This led him to develop his special theory of relativity during his time at the Swiss Patent Office in Bern (1902–1909), Switzerland. However, he realized that the principle of relativity could also be extended to gravitational fields and—with his subsequent theory of gravitation in 1916—he published a paper on general relativity. He continued to deal with problems of statistical mechanics and quantum theory, which led to his explanations of particle theory and the motion of molecules. He also investigated the thermal properties of light which laid the foundation of the photon theory of light. In 1917, Einstein applied the general theory of relativity to model the large-scale structure of the universe. Between 1895 and 1914 he lived in Switzerland (except for one year in Prague, 1911–12), where he received his academic diploma from the Swiss Federal Polytechnic in Zürich (later the Eidgenössische Technische Hochschule, ETH) in 1900. He later taught there at the same institute as a professor of theoretical physics between 1912 and 1914 before he left for Berlin. In 1901, after being stateless for more than five years, Einstein acquired Swiss citizenship, which he kept for the rest of his life. In 1905, Einstein was awarded a PhD by the University of Zürich. The same year, his annus mirabilis (miracle year), he published four groundbreaking papers, which were to bring him to the notice of the academic world, at the age of 26. He was visiting the United States when Adolf Hitler came to power in 1933 and—being Jewish—did not go back to Germany, where he had been a professor at the Berlin Academy of Sciences. He settled in the United States, becoming an American citizen in 1940. On the eve of World War II, he endorsed a letter to President Franklin D. Roosevelt alerting him to the potential development of "extremely powerful bombs of a new type" and recommending that the U.S. begin similar research. This eventually led to what would become the Manhattan Project. Einstein supported defending the Allied forces, but generally denounced the idea of using the newly discovered nuclear fission as a weapon. Later, with the British philosopher Bertrand Russell, Einstein signed the Russell–Einstein Manifesto, which highlighted the danger of nuclear weapons. Einstein was affiliated with the Institute for Advanced Study in Princeton, New Jersey, until his death in 1955. Einstein published more than 300 scientific papers along with over 150 non-scientific works. Einstein's intellectual achievements and originality have made the word "Einstein" synonymous with "genius". Albert Einstein (/ˈaɪnstaɪn/; German: [ˈalbɛɐ̯t ˈaɪnʃtaɪn] ( listen); 14 March 1879 – 18 April 1955) was a German-born theoretical physicist. Einstein developed the theory of relativity, one of the two pillars of modern physics (alongside quantum mechanics). :274 Einstein's work is also known for its influence on the philosophy of science. Einstein is best known by the general public for his mass–energy equivalence formula E = mc2 (which has been dubbed "the world's most famous equation"). He received the 1921 Nobel Prize in Physics "for his services to theoretical physics, and especially for his discovery of the law of the photoelectric effect", a pivotal step in the evolution of quantum theory. Near the beginning of his career, Einstein thought that Newtonian mechanics was no longer enough to reconcile the laws of classical mechanics with the laws of the electromagnetic field. This led him to develop his special theory of relativity during his time at the Swiss Patent Office in Bern (1902–1909), Switzerland. However, he realized that the principle of relativity could also be extended to gravitational fields and—with his subsequent theory of gravitation in 1916—he published a paper on general relativity. He continued to deal with problems of statistical mechanics and quantum theory, which led to his explanations of particle theory and the motion of molecules. He also investigated the thermal properties of light which laid the foundation of the photon theory of light. In 1917, Einstein applied the general theory of relativity to model the large-scale structure of the universe. Between 1895 and 1914 he lived in Switzerland (except for one year in Prague, 1911–12), where he received his academic diploma from the Swiss Federal Polytechnic in Zürich (later the Eidgenössische Technische Hochschule, ETH) in 1900. He later taught there at the same institute as a professor of theoretical physics between 1912 and 1914 before he left for Berlin. In 1901, after being stateless for more than five years, Einstein acquired Swiss citizenship, which he kept for the rest of his life. In 1905, Einstein was awarded a PhD by the University of Zürich. The same year, his annus mirabilis (miracle year), he published four groundbreaking papers, which were to bring him to the notice of the academic world, at the age of 26. He was visiting the United States when Adolf Hitler came to power in 1933 and—being Jewish—did not go back to Germany, where he had been a professor at the Berlin Academy of Sciences. He settled in the United States, becoming an American citizen in 1940. On the eve of World War II, he endorsed a letter to President Franklin D. Roosevelt alerting him to the potential development of "extremely powerful bombs of a new type" and recommending that the U.S. begin similar research. This eventually led to what would become the Manhattan Project. Einstein supported defending the Allied forces, but generally denounced the idea of using the newly discovered nuclear fission as a weapon. Later, with the British philosopher Bertrand Russell, Einstein signed the Russell–Einstein Manifesto, which highlighted the danger of nuclear weapons. Einstein was affiliated with the Institute for Advanced Study in Princeton, New Jersey, until his death in 1955. Einstein published more than 300 scientific papers along with over 150 non-scientific works. Einstein's intellectual achievements and originality have made the word "Einstein" synonymous with "genius". 1.7 1930–1931: Travel to the U.S.
1.8 1933: Emigration to the U.S. 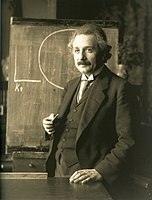 The Einsteins were non-observant Ashkenazi Jews, and Albert attended a Catholic elementary school in Munich from the age of 5 for three years. At the age of 8, he was transferred to the Luitpold Gymnasium (now known as the Albert Einstein Gymnasium), where he received advanced primary and secondary school education until he left the German Empire seven years later. In 1894, Hermann and Jakob's company lost a bid to supply the city of Munich with electrical lighting because they lacked the capital to convert their equipment from the direct current (DC) standard to the more efficient alternating current (AC) standard. The loss forced the sale of the Munich factory. In search of business, the Einstein family moved to Italy, first to Milan and a few months later to Pavia. When the family moved to Pavia, Einstein stayed in Munich to finish his studies at the Luitpold Gymnasium. His father intended for him to pursue electrical engineering, but Einstein clashed with authorities and resented the school's regimen and teaching method. He later wrote that the spirit of learning and creative thought was lost in strict rote learning. At the end of December 1894, he travelled to Italy to join his family in Pavia, convincing the school to let him go by using a doctor's note. During his time in Italy he wrote a short essay with the title "On the Investigation of the State of the Ether in a Magnetic Field". In 1895, at the age of 16, Einstein took the entrance examinations for the Swiss Federal Polytechnic in Zürich (later the Eidgenössische Technische Hochschule, ETH). He failed to reach the required standard in the general part of the examination, but obtained exceptional grades in physics and mathematics. On the advice of the principal of the Polytechnic, he attended the Argovian cantonal school (gymnasium) in Aarau, Switzerland, in 1895–96 to complete his secondary schooling. While lodging with the family of professor Jost Winteler, he fell in love with Winteler's daughter, Marie. (Albert's sister Maja later married Winteler's son Paul.) In January 1896, with his father's approval, Einstein renounced his citizenship in the German Kingdom of Württemberg to avoid military service. In September 1896, he passed the Swiss Matura with mostly good grades, including a top grade of 6 in physics and mathematical subjects, on a scale of 1–6. Though only 17, he enrolled in the four-year mathematics and physics teaching diploma program at the Zürich Polytechnic. Marie Winteler moved to Olsberg, Switzerland, for a teaching post. Einstein's future wife, Mileva Marić, also enrolled at the Polytechnic that year. She was the only woman among the six students in the mathematics and physics section of the teaching diploma course. Over the next few years, Einstein and Marić's friendship developed into romance, and they read books together on extra-curricular physics in which Einstein was taking an increasing interest. In 1900, Einstein was awarded the Zürich Polytechnic teaching diploma, but Marić failed the examination with a poor grade in the mathematics component, theory of functions. There have been claims that Marić collaborated with Einstein on his 1905 papers, known as the Annus Mirabilis papers, but historians of physics who have studied the issue find no evidence that she made any substantive contributions. The discovery and publication in 1987 of an early correspondence between Einstein and Marić revealed that they had had a daughter, called "Lieserl" in their letters, born in early 1902 in Novi Sad where Marić was staying with her parents. Marić returned to Switzerland without the child, whose real name and fate are unknown. Einstein probably never saw his daughter. The contents of his letter to Marić in September 1903 suggest that the girl was either given up for adoption or died of scarlet fever in infancy. Einstein and Marić married in January 1903. In May 1904, their first son, Hans Albert Einstein, was born in Bern, Switzerland. Their second son, Eduard, was born in Zürich in July 1910. In April 1914 they moved to Berlin. After a few months his wife returned to Zürich with their sons, after learning that Einstein's chief romantic attraction was his first and second cousin Elsa. They divorced on 14 February 1919, having lived apart for five years. Eduard, whom his father called "Tete" (for petit), had a breakdown at about age 20 and was diagnosed with schizophrenia. His mother cared for him and he was also committed to asylums for several periods, finally being committed permanently after her death. In letters revealed in 2015, Einstein wrote to his early love, Marie Winteler, about his marriage and his still-strong feelings for Marie. In 1910 he wrote to her that "I think of you in heartfelt love every spare minute and am so unhappy as only a man can be" while his wife was pregnant with their second child. Einstein spoke about a "misguided love" and a "missed life" regarding his love for Marie. Einstein married Elsa Löwenthal in 1919, after having had a personal relationship with her since 1912. She was a first cousin maternally and a second cousin paternally. In 1933, they emigrated to the United States. In 1935, Elsa Einstein was diagnosed with heart and kidney problems; she died in December 1936. Among Einstein's well-known friends were Michele Besso, Paul Ehrenfest, Marcel Grossmann, János Plesch, Maurice Solovine, and Stephen Wise. In 1900, Einstein's paper "Folgerungen aus den Capillaritätserscheinungen" ("Conclusions from the Capillarity Phenomena") was published in the journal Annalen der Physik. On 30 April 1905, Einstein completed his thesis, with Alfred Kleiner, Professor of Experimental Physics, serving as pro-forma advisor. As a result, Einstein was awarded a PhD by the University of Zürich, with his dissertation "A New Determination of Molecular Dimensions". That same year, which has been called Einstein's annus mirabilis (miracle year), he published four groundbreaking papers, on the photoelectric effect, Brownian motion, special relativity, and the equivalence of mass and energy, which were to bring him to the notice of the academic world, at the age of 26. 1930–1931: Travel to the U.S. In December 1930, Einstein visited America for the second time, originally intended as a two-month working visit as a research fellow at the California Institute of Technology. After the national attention he received during his first trip to the U.S., he and his arrangers aimed to protect his privacy. Although swamped with telegrams and invitations to receive awards or speak publicly, he declined them all. 1933: Emigration to the U.S.
A month later, Einstein's works were among those targeted by the German Student Union in the Nazi book burnings, with Nazi propaganda minister Joseph Goebbels proclaiming, "Jewish intellectualism is dead." One German magazine included him in a list of enemies of the German regime with the phrase, "not yet hanged", offering a $5,000 bounty on his head. In a subsequent letter to physicist and friend Max Born, who had already emigrated from Germany to England, Einstein wrote, "... I must confess that the degree of their brutality and cowardice came as something of a surprise." After moving to the U.S., he described the book burnings as a "spontaneous emotional outburst" by those who "shun popular enlightenment," and "more than anything else in the world, fear the influence of men of intellectual independence." Einstein was now without a permanent home, unsure where he would live and work, and equally worried about the fate of countless other scientists still in Germany. He rented a house in De Haan, Belgium, where he lived for a few months. In late July 1933, he went to England for about six weeks at the personal invitation of British naval officer Commander Oliver Locker-Lampson, who had become friends with Einstein in the preceding years. To protect Einstein, Locker-Lampson had two assistants watch over him at his secluded cottage outside London, with photo of them carrying shotguns and guarding Einstein, published in the Daily Herald on July 24, 1933. Locker-Lampson took Einstein to meet Winston Churchill at his home, and later, Austen Chamberlain and former Prime Minister Lloyd George. Einstein asked them to help bring Jewish scientists out of Germany. British historian Martin Gilbert notes that Churchill responded immediately, and sent his friend, physicist Frederick Lindemann to Germany to seek out Jewish scientists and place them in British universities. Churchill later observed that as a result of Germany having driven the Jews out, they had lowered their "technical standards" and put the Allies' technology ahead of theirs. Locker-Lampson also submitted a bill to parliament to extend British citizenship to Einstein, during which period Einstein made a number of public appearances describing the crisis brewing in Europe. In one of his speeches he denounced Germany's treatment of Jews, while at the same time he introduced a bill promoting Jewish citizenship in Palestine, as they were being denied citizenship elsewhere. In his speech he described Einstein as a "citizen of the world" who should be offered a temporary shelter in the U.K.[note 2] Both bills failed, however, and Einstein then accepted an earlier offer from the Princeton Institute for Advanced Study, in the U.S., to become a resident scholar. In October 1933 Einstein returned to the U.S. and took up a position at the Institute for Advanced Study, noted for having become a refuge for scientists fleeing Nazi Germany. At the time, most American universities, including Harvard, Princeton and Yale, had minimal or no Jewish faculty or students, as a result of their Jewish quota which lasted until the late 1940s. In 1939, a group of Hungarian scientists that included émigré physicist Leó Szilárd attempted to alert Washington to ongoing Nazi atomic bomb research. The group's warnings were discounted. Einstein and Szilárd, along with other refugees such as Edward Teller and Eugene Wigner, "regarded it as their responsibility to alert Americans to the possibility that German scientists might win the race to build an atomic bomb, and to warn that Hitler would be more than willing to resort to such a weapon." To make certain the U.S. was aware of the danger, in July 1939, a few months before the beginning of World War II in Europe, Szilárd and Wigner visited Einstein to explain the possibility of atomic bombs, which Einstein, a pacifist, said he had never considered. He was asked to lend his support by writing a letter, with Szilárd, to President Roosevelt, recommending the U.S. pay attention and engage in its own nuclear weapons research. The letter is believed to be "arguably the key stimulus for the U.S. adoption of serious investigations into nuclear weapons on the eve of the U.S. entry into World War II". In addition to the letter, Einstein used his connections with the Belgian Royal Family and the Belgian queen mother to get access with a personal envoy to the White House's Oval Office. President Roosevelt could not take the risk of allowing Hitler to possess atomic bombs first. As a result of Einstein's letter and his meetings with Roosevelt, the U.S. entered the "race" to develop the bomb, drawing on its "immense material, financial, and scientific resources" to initiate the Manhattan Project. The U.S. became the only country to successfully develop nuclear weapons during World War II and also remains the only country to have used them in combat, against Hiroshima and Nagasaki on August 6 and 9, 1945, respectively, towards the end of the war. For Einstein, "war was a disease ... [and] he called for resistance to war." By signing the letter to Roosevelt, he went against his pacifist principles. In 1954, a year before his death, Einstein said to his old friend, Linus Pauling, "I made one great mistake in my life—when I signed the letter to President Roosevelt recommending that atom bombs be made; but there was some justification—the danger that the Germans would make them ..."
Einstein was a passionate, committed antiracist and joined National Association for the Advancement of Colored People (NAACP) in Princeton, where he campaigned for the civil rights of African Americans. He considered racism America's "worst disease," seeing it as "handed down from one generation to the next". As part of his involvement, he corresponded with civil rights activist W. E. B. Du Bois and was prepared to testify on his behalf during his trial in 1951.:565 When Einstein offered to be a character witness for Du Bois, the judge decided to drop the case. His mother played the piano reasonably well and wanted her son to learn the violin, not only to instill in him a love of music but also to help him assimilate into German culture. According to conductor Leon Botstein, Einstein is said to have begun playing when he was 5, although he did not enjoy it at that age. Einstein spoke of his religious outlook in a wide array of original writings and interviews. Einstein stated that he believed in the pantheistic God of Baruch Spinoza. He did not believe in a personal God who concerns himself with fates and actions of human beings, a view which he described as naïve. He clarified however that, "I am not an atheist", preferring to call himself an agnostic, or a "deeply religious nonbeliever". When asked if he believed in an afterlife, Einstein replied, "No. And one life is enough for me." Einstein refused surgery, saying: "I want to go when I want. It is tasteless to prolong life artificially. I have done my share, it is time to go. I will do it elegantly." He died in Princeton Hospital early the next morning at the age of 76, having continued to work until near the end. In a memorial lecture delivered on December 13, 1965, at UNESCO headquarters, nuclear physicist Robert Oppenheimer summarized his impression of Einstein as a person: "He was almost wholly without sophistication and wholly without worldliness ... There was always with him a wonderful purity at once childlike and profoundly stubborn." Throughout his life, Einstein published hundreds of books and articles. He published more than 300 scientific papers and 150 non-scientific ones. On 5 December 2014, universities and archives announced the release of Einstein's papers, comprising more than 30,000 unique documents. Einstein's intellectual achievements and originality have made the word "Einstein" synonymous with "genius". In addition to the work he did by himself he also collaborated with other scientists on additional projects including the Bose–Einstein statistics, the Einstein refrigerator and others. In 1911, Einstein published another article "On the Influence of Gravitation on the Propagation of Light" expanding on the 1907 article, in which he estimated the amount of deflection of light by massive bodies. Thus, the theoretical prediction of general relativity can for the first time be tested experimentally. The first, indirect, detection of gravitational waves came in the 1970s through observation of a pair of closely orbiting neutron stars, PSR B1913+16. The explanation of the decay in their orbital period was that they were emitting gravitational waves. Einstein's prediction was confirmed on 11 February 2016, when researchers at LIGO published the first observation of gravitational waves, on Earth, exactly one hundred years after the prediction. Einstein was displeased with quantum theory and quantum mechanics (a theory he had helped create), despite its acceptance by other physicists, stating that God "is not playing at dice." Einstein continued to maintain his disbelief in the theory, and attempted unsuccessfully to disprove it until he died at the age of 76. In 1917, at the height of his work on relativity, Einstein published an article in Physikalische Zeitschrift that proposed the possibility of stimulated emission, the physical process that makes possible the maser and the laser. This article showed that the statistics of absorption and emission of light would only be consistent with Planck's distribution law if the emission of light into a mode with n photons would be enhanced statistically compared to the emission of light into an empty mode. This paper was enormously influential in the later development of quantum mechanics, because it was the first paper to show that the statistics of atomic transitions had simple laws. Einstein discovered Louis de Broglie's work, and supported his ideas, which were received skeptically at first. In another major paper from this era, Einstein gave a wave equation for de Broglie waves, which Einstein suggested was the Hamilton–Jacobi equation of mechanics. This paper would inspire Schrödinger's work of 1926. The Bohr–Einstein debates were a series of public disputes about quantum mechanics between Einstein and Niels Bohr who were two of its founders. Their debates are remembered because of their importance to the philosophy of science. Their debates would influence later interpretations of quantum mechanics. In 1935, Einstein returned to the question of quantum mechanics. He considered how a measurement on one of two entangled particles would affect the other. He noted, along with his collaborators, that by performing different measurements on the distant particle, either of position or momentum, different properties of the entangled partner could be discovered without disturbing it in any way. He then used a hypothesis of local realism to conclude that the other particle had these properties already determined. The principle he proposed is that if it is possible to determine what the answer to a position or momentum measurement would be, without in any way disturbing the particle, then the particle actually has values of position or momentum. This principle distilled the essence of Einstein's objection to quantum mechanics. As a physical principle, it was shown to be incorrect when the Aspect experiment of 1982 confirmed Bell's theorem, which had been promulgated in 1964. Einstein, Albert (1924) [Published 10 July 1924], "Quantentheorie des einatomigen idealen Gases" [Quantum theory of monatomic ideal gases] (Online page images), Sitzungsberichte der Preussischen Akademie der Wissenschaften, Physikalisch-Mathematische Klasse (in German), Munich, Germany: Königlich Preussische Akademie der Wissenschaften, Berlin: 261–267 – via ECHO, Cultural Heritage Online, Max Planck Institute for the History of Science . First of a series of papers on this topic. Einstein, Albert (1979), Autobiographical Notes, Paul Arthur Schilpp (Centennial ed. ), Chicago: Open Court, ISBN 0-87548-352-6 . The chasing a light beam thought experiment is described on pages 48–51.